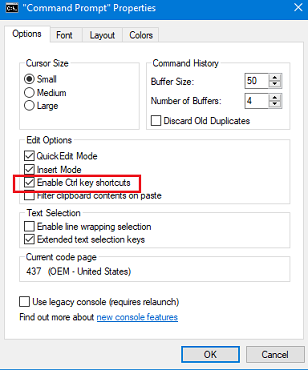 By default, Ctrl key shortcuts are turned on in Windows 10 command prompt. But if you disabled it unknowingly, I will tell you how to enable it again and paste texts from other programs. Microsoft has introduced keyboard shortcuts like Ctrl+C, Ctrl+V for Command Prompt users with Windows 10 update in the third-quarter of 2015. It was difficult for us to copy and paste texts in the earlier versions of Windows OS. Now you’re able to perform those tasks in CMD without any configuration. Even though I will tell you how to enable the feature. 1. 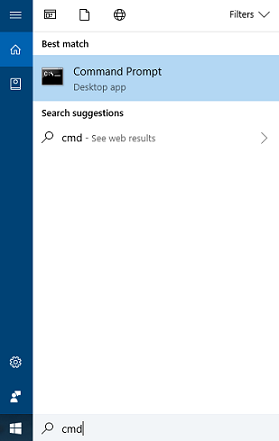 Open Command Prompt: Type CMD in the search box, that appears on the taskbar of your computer. Click on the app icon to open. 2. 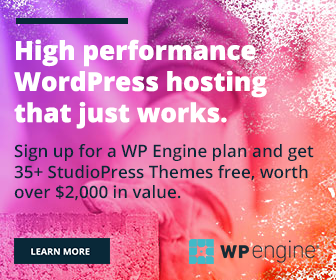 Right-click on the title bar and choose “Properties”. 3. You will get various options to customize the look of Command Prompt. 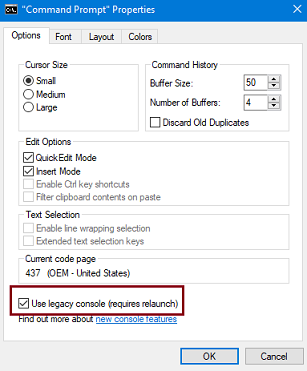 Scroll down to the bottom to find “Use legacy console” checkbox. It should remain as unchecked. If not, uncheck the box to turn on Ctrl key shortcuts. 4. The above step will automatically activate the shortcut keys in CMD. Click on OK. Now you can select texts in the command prompt using the mouse or keyboard, copy, and paste it into other programs. You will also be able to copy texts from other windows to the command prompt as well.